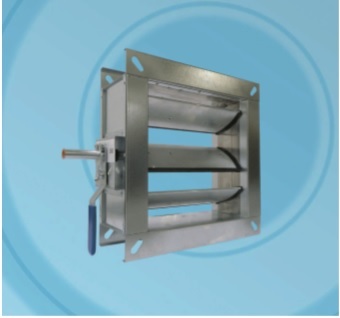 The HD-LL series damper has been designed for air conditioning and ventilation systems requiring air control and low closed blade leakage performance. The aerodynamic aluminium reinforced blade design requires only a single blade edge seal to the trailing edge. The blade seal profile has an engineered shoulder design to ensure a positive sealed connection between the blade and fitted seal. The blade seal acquiescent profile design accepts the blade leading edge of the interconnecting adjacent blade ensuring a good compressible seal with minimum torque, returning to its original form when the blades re-open. Control can be effected by a manual quadrant, fitted actuator of choice or extended spindle for actuation by others. The BSB HD-LL Series Low Leakage Heavy Duty dampers are available in a variety of vertical or horizontal mounting configurations from 100mm square/dia. to 1000mm square/dia. Casing 1.2mm (18swg) galvanised mild steel to BS EN 10346 specification DX 51D Z275. Coating Class Fe P02b Z275 Na. When circular or flat oval spigots are supplied, the material will be 0.7mm zintec for the spigots only. Blades Extruded airfoil aluminium to BS EN 755 Part 9 specification 6063 T6, wall thickness 1.25mm (18swg) minimum. Blade Edge Seals Extruded hollow section TPE blade edge seal with temperature before distortion 5°C to + 70°C. Side Seal Gasket Grade 302 stainless steel hard rolled to BS EN 10151: 2002, 0.20mm thick Options: Grades 316 stainless steel Blade End Caps Injection moulded black polypropylene to BSB’s recorded design. Blade Spindles 19.05mm diameter galvanised mild steel tube with corrosion resistant “Flo-Coat”. Drive Spindles 19.05mm diameter galvanised mild steel tube with corrosion resistant “Flo-Coat”. Quadrant 1.2mm (18swg) galvanised mild steel chassis with integral rotation slot and blade position indication. 30mm x 2.75mm (1 3/16” x 1/8”) zinc plated mild steel handle with integral clamp and locking nut to BS EN 10142 1991. Coating Class BS1706. Linkage Crank Arm: 30mm x 2.75mm zinc plated mild steel spindle clamp with integral 8mm diameter drive pins 3mm thick. Drive Bar: 20mm x 3mm flat bar punched to fit onto zinc plated drive pins. Bushes Punch-formed bushes are formed within the casing to provide a low friction bearing for the blade spindles to rotate. Nylon 66 bushes and Oilite bushes impregnated with mineral oil to ISO VG 100 (SAE 30) can be supplied. Rivets High quality self-sealed rivets used to European standards as relevant. Sealant All joints and seams are sealed with sealant conforming to dictates of DW144. Paint Low VOC water based primer applied to all welds. Operating Temperature +5°C to +70°C as standard.